One-page websites are definitely trendy nowadays. With most people using their mobile devices to acquire all kinds of information from the Internet, one-page layouts have proven to be an effective and efficient way to gather data as they allow clear and easy navigation across the website as well as faster loading time on all major browsers. Using the best one-page website template for your website also gives you a lot of benefits. It does not just let you control the flow of information that you want to share with your readers; it also provides them with a great user experience that will keep them coming back for more. That is why we have scoured the whole World Wide Web to collect a number of modern and creative one-page HTML website themes and templates for you to use or find inspiration from. You can rest assured that these templates are packed with the latest and trendiest web design standards and technologies in order to help you build a state-of-the-art and one-of-a-kind web portal for your businesses or other personal uses. So check out these goodies below. To start with, here is OnePager, a one-page multipurpose responsive HTML5 template that comes with over 24 unique and valid HTML pages for different business niches. 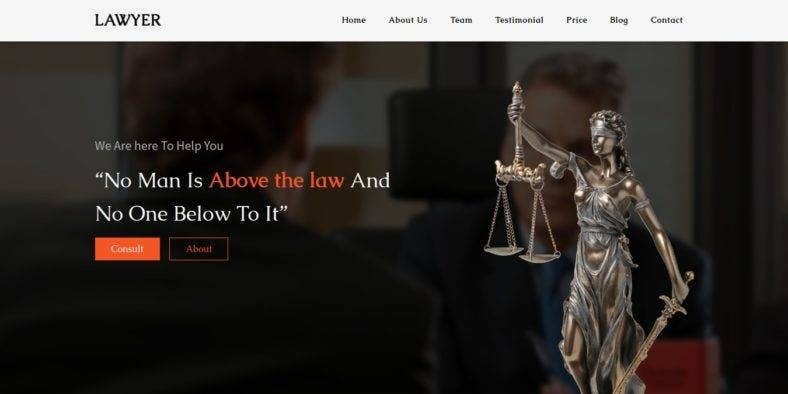 Whether you are building a website for your law firm, barber shop, wedding invitations, app products, online resume, and so on, this theme has everything to that cater to all your business needs. Built with the latest Bootstrap version on a 12-column responsive grid, OnePager boasts of a number of powerful features and a bunch of customization options. Among its features are the fully responsive layout, retina-ready design, and cross-browser compatibility, among others. It also comes with unique header styles, a separate color file, and more to customize the theme. Next is the one-page parallax website theme, BizzOne, that comes with unlimited possibilities in terms of functionality and customizability. Made from the most recent version 4 of the Bootstrap framework, it comes with a smart, minimal, and clean design that suits any and all startup businesses, companies, and agencies who wish to showcase their products and services. The theme also includes lots of features that are essential for any business website. These include a working Contact Form with PHP and Ajax, a vertical Price Plan, and others. BizzOne also features some awesome parallax effects to enhance your site’s visual quality as well as six homepage layout variations to choose from for easy customization. Here is Mitex, another responsive one-page parallax website template that is especially created for any creative agency or business startup. It comes with multiple home page layouts and navigation styles which are powered by CSS and jQuery technologies, along with tons of features to help you build a unique and professional-looking website of your own. 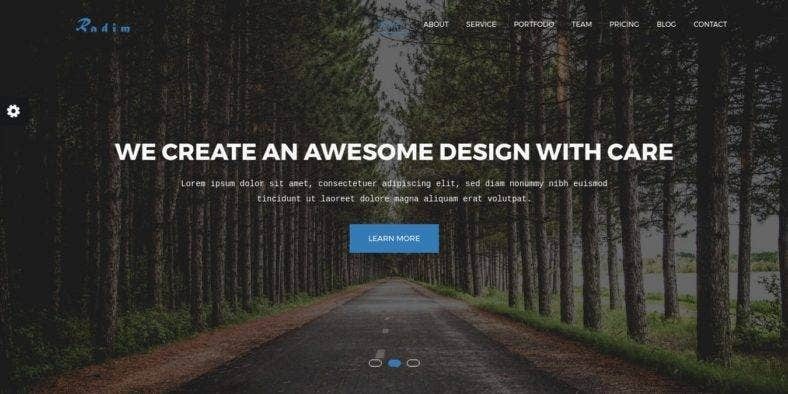 Moreover, the theme provides five various template options, so you can choose between the classic, video background, parallax carousel, colorful and lighter, and side menu versions. Aside from these, Mitex also features a working Contact Form to help generate leads, a super responsive layout that adapts to all standard devices, a retina-ready design so it displays well on all modern screens, a powerful code for ease of use and customization, and other trendy technologies. Then, we have Avatar. This one-page multipurpose business HTML5 template is characterized by a clean and modern design that is integrated into all of the seven home page versions included in this template. Moreover, it has a fully responsive design which ensures your website will look great on all devices as it is built with Bootstrap—a sleek, intuitive, and powerful framework. Its core features include Swiper Touch and Revolution sliders, Google Web Fonts, Font Awesome icons, a justified gallery, Magnific popup, parallax backgrounds, animated skills bar, an Ajax contact form, unlimited layout options, and so much more. Avatar is also fully responsive, retina-ready, and speed-optimized as it is based on the Bootstrap Grid System. RockoX is another one-page parallax and responsive website template which includes multiple layouts with both light and dark concepts for you to choose, so your website suits your taste or business image. Being built with Bootstrap 3, this template is guaranteed to look perfect on any mobile and desktop device with different screen sizes and various image resolutions. The theme also features lots of CSS and jQuery animations to enhance its visual aesthetic and make the theme perfect for design studios and creative agencies, too. Aside from its colorful elements, RockoX includes shop pages in case you wish to sell your works and build an eCommerce website. Its well-written and documented code allow easy customization. 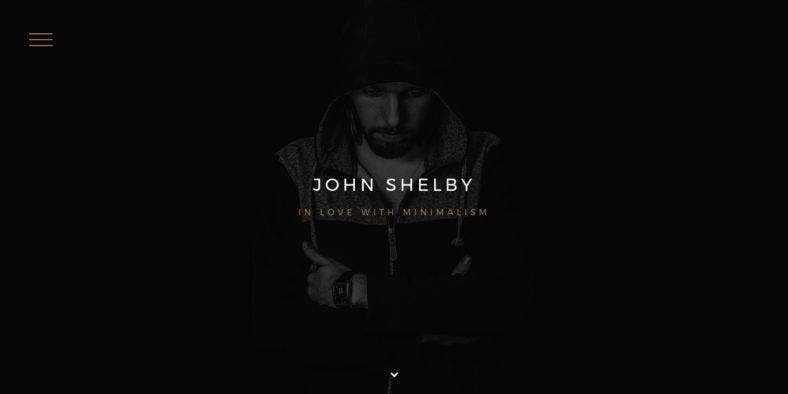 A dark and minimalist website theme, Shelby is a simple and easy to use one-page portfolio template with a classy and sophisticated look that is highly professional and business-like. Its clean and modern design with a fully responsive layout is perfect for personal freelancers who are looking for a competent way to demonstrate their abilities to potential clients. Using the latest HTML5 and CSS3 web design standards, Shelby is packed with a bunch of state-of-the-art features which include CSS3 animations for visual enhancement, smooth scroll and parallax scroll options for easy navigation, a huge set of Font Awesome icons and Google fonts for a gorgeous typography, and a well-documented code for easy customization. Another clean and sophisticated theme is Rondo. A responsive one-page website template, it comes with a unique design that is flat and minimal, perfect for any website niche, but most especially for designers, illustrators, photographers, video producers, and other creative individuals who wish to showcase their works and establish an online presence. Rondo also features a highly responsive design which enables the template to fully adapt to any screen size your website is viewed on. It also integrates a parallax effect on the layout for added visual value and a collection of beautiful Google Fonts for a stunning typography. This theme is developed with W3C valid HTML5 and CSS3 code, so it is easy to use and modify. Next is a single page website template called North21. With a unique layout and one-of-a-kind navigation menu, this responsive HTML5 theme is created with photography and other creative businesses in mind. Built with Bootstrap and coded with valid HTML5 and CSS3, it boasts of an extremely responsive layout and modern retina-ready layout as well as other cool features. These cool features include five available color schemes, parallax and external page examples, header scroll text fade, a Contact Form with validation, filterable gallery, fixed navigation menu, hundreds of Font Awesome icons, video background support, and many others. North21 is SEO-friendly and cross-browser compatible, ensuring a high search engine ranking. The professional-looking and modern web design template you see above is Genesis. 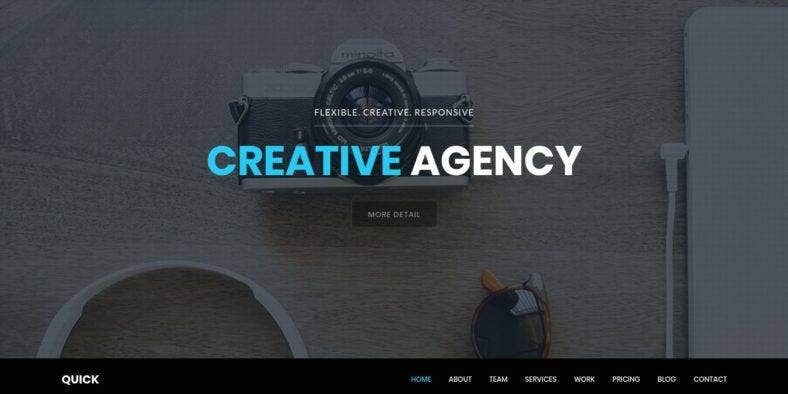 It is a multipurpose website theme with a clean and minimalist one-page layout perfectly suitable for creative agencies as well as design professionals. It comes with a pack of essential and powerful features that lets your content take the center stage and bask in the spotlight. Among these features are the responsive layout which adjusts to fit various devices, retina support to display elements with correct resolution, a built-in image slide to showcase your portfolio, beautiful and scalable vector icons, Google Fonts for fabulous typography, configurable color options to choose from, SEO readiness, and so much more. 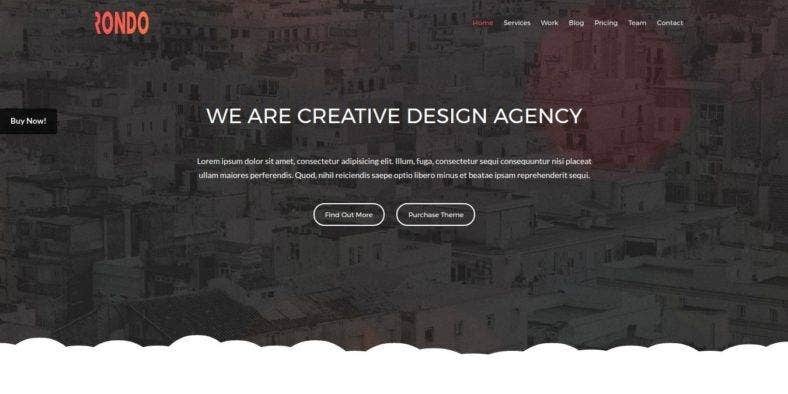 This beautiful one-page HTML website template you see above is a bright and colorful theme for web studios, web agencies, and other creative companies. Its highly creative and individual design is a great solution to showcase your works as well as services, along with other possible purposes. 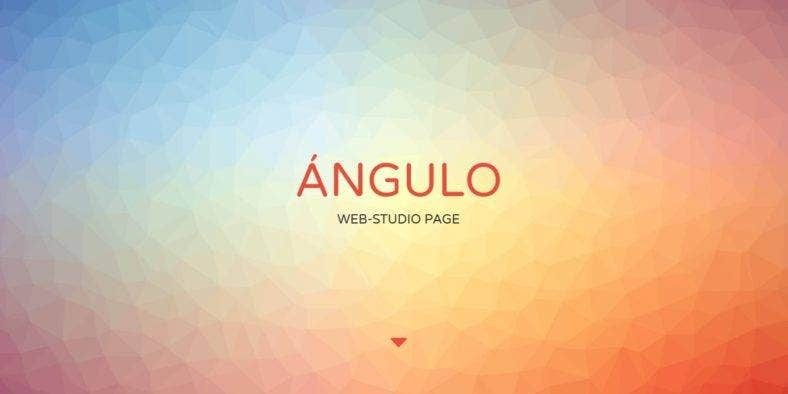 You can use Angulo to show your previous web design works, graphic designs, etc. Developed using the latest HTML5, CSS3, SASS, and JS technologies, the theme is also integrated with Compass and SCSS and is built on the Skeleton grid framework. Therefore, Angulo features a highly responsive layout, retina-ready design, cross-browser compatibility, and other contemporary attributes. It also includes free fonts and images. Radim is a responsive business website theme with a fresh design thanks to its full-screen image background, clean and simple layout, and lots of options for customization. It has over 50 HTML pages available, six types of blog pages and four portfolio page variants, all with both light and dark versions and various sidebar layouts. Other features that this theme includes are the fully responsive and mobile-ready layout, hundreds of Font Awesome icons, Google fonts, various backgrounds and color schemes, and other options that help make this template easy to customize. It also features Mixitup portfolio filtering, smooth animations and stunning parallax effects, a working contact form, and more. 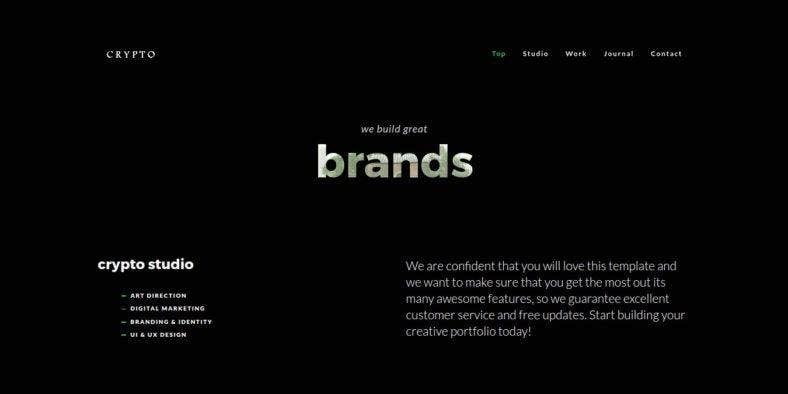 The creative one-page and multi-page portfolio website template you see above has a rather dark but classy take on its visual aesthetic which is perfect for both corporate and design websites. Crypto provides you with a sophisticated and professional way to display products or works as well as a perfect web design tool with tons of features that enhance its functionality. A complete and versatile HTML website theme, it is comprised of unique features such as menu letter background effects, animated image pieces, Tooltip shapes and animations, masonry and grid portfolio layouts, smooth scrolling with parallax effects, unlimited colors with custom color schemes, a responsive layout, retina-ready design, Google Fonts support, and so much more. 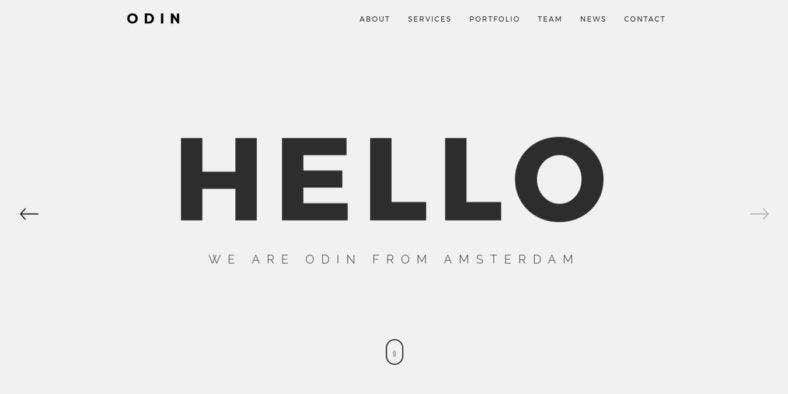 On the contrary, Odin is another creative one-page website theme with a simple and clean design that is elegant and trendy at the same time. 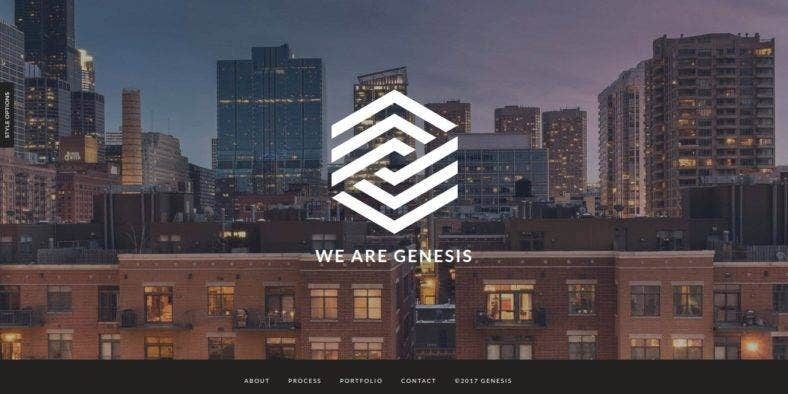 It is characterized by a black-and-white color palette and a minimal but unique layout which is perfect for any modern creative agency or individual designer portfolio as well as business or corporate websites. Featuring 10 homepage variants to choose from, Odin also comes with additional pages for single projects, error pages, and such. Perfectly responsive and mobile-optimized, this template adapts well to all devices with different screen sizes. Furthermore, it also includes features such as a Slider Revolution, animated elements with over 50 effects, unlimited parallax layers, etc. If you’re a music lover and you’re looking for a great way to share your love for music online, then Music is just the theme you are looking for. 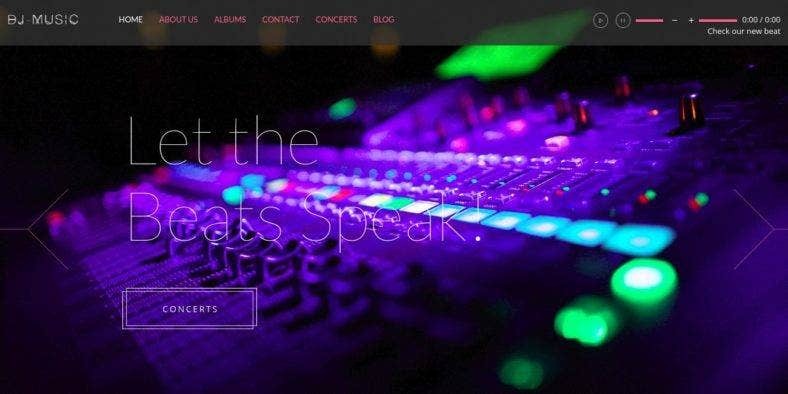 A one-page and multi-page music website theme, this responsive HTML theme is highly creative and extremely functional with lots of trendy elements and features that will surely draw your target audience’s attention. Based on one of the most recent Bootstrap CSS framework versions, Music is integrated with a bunch of HTML5 and CSS3 techniques such as the W3C valid code, CSS3 animations, cool text effects, Google Fonts integration, and so much more. Its content includes different sections for albums, concerts, posts, gallery, testimonials, newsletter signups, subscriptions, and contacts. 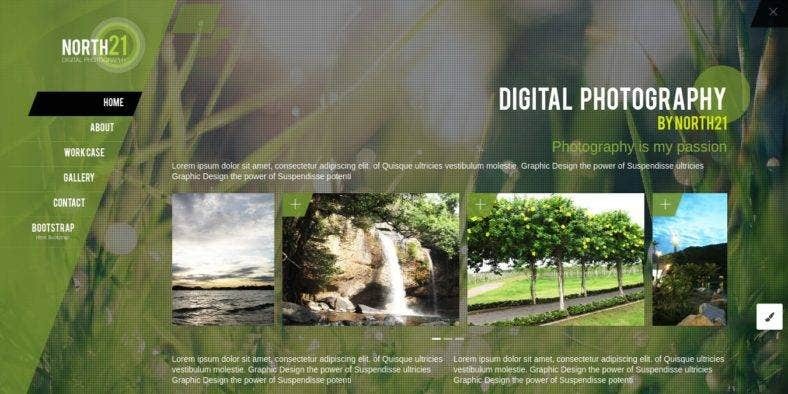 This one-page portfolio template you see has a one-of-a-kind layout on a one-page design that is based on Bootstrap’s 1170px Grid System. 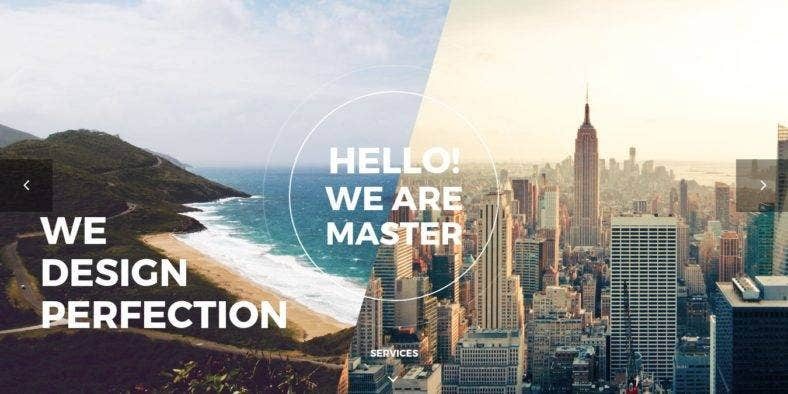 Master is an HTML website theme packed with modern features that can be used for different kinds of websites like landing pages, portfolios, and others. Its well-organized components let you modify and customize the theme easily. Additionally, Master is filled with trendy options such as a huge set of free icons and fonts, perfectly flat graphics, two-column layouts, and so much more. It is fully responsive so it adapts quickly and easily to all devices. The theme also boasts support for all major browsers, making your website compatible with Firefox, Safari, Opera, Chrome, and many others. 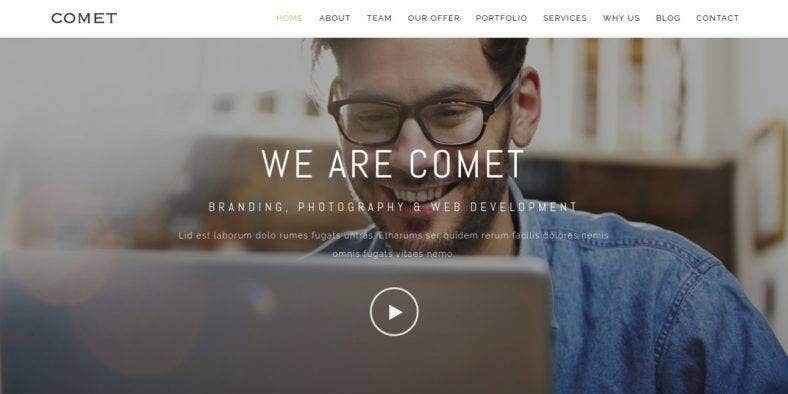 Comet, on the other hand, is a creative multipurpose website template that comes with a simple design and clean layout, but packed with lots of features and options. Based on Twitter Bootstrap, it a powerful HTML theme which includes a number of one-page and multi-page layout demos to choose from or create unlimited combinations of elements. With features that include a fully responsive design, parallax sections, various backgrounds with parallax and video support, different portfolio layouts, and more, the theme is the perfect answer for many types of websites for different business niches. Comet can be used for personal blogs, creative portfolios, business web portals, and corporate websites, among others. Here is a business Bootstrap template called Clarity. Just like its given moniker, this multipurpose website theme has a clear and modern design that suits any type of website, from businesses and agencies to personal blogs and online portfolios. It is fully responsive and extremely customizable with lots of options to choose from. Clarity comes with over 12 homepage options with one-page and multi-page layouts, along with two additional Coming Soon page options. It also features 10 banner layouts, four header versions, five navigation menus, six footer variations, four testimonial options, and so much more. It also includes a carousel slider, page title, gallery, a counter, countdown timer, etc. 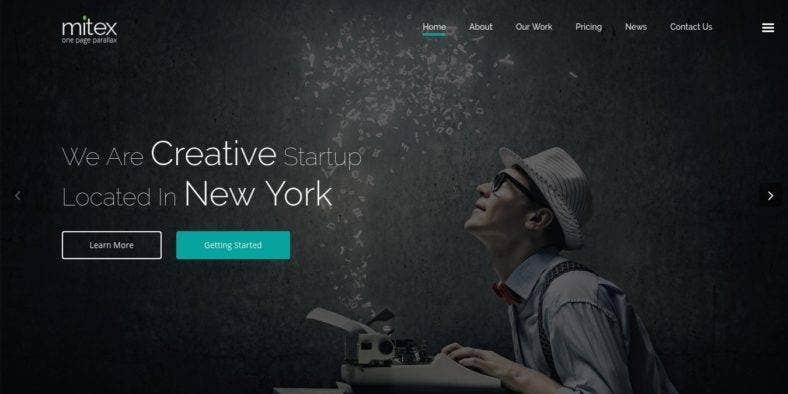 A one-page business startup website template, Fullstack comes with a stylish and contemporary design which makes it a perfect tool to launch your small business or new venture. It includes five homepage variations for you to choose from and one Coming Soon page with a countdown timer. With its many features and options, this theme is easy to customize to fit your needs. Included in the template’s features are the highly responsive layout, full-screen single image and slideshow backgrounds, huge icons pack with Font Awesome, Google Web Fonts support, CSS animations, text rotator, a chat feature with Olark free snippets, and more. Fullstack is built with Bootstrap and developed using the latest HTML5, CSS3, and jQuery standards. Another responsive Bootstrap theme for multiple purposes, Qube comes with over 12 modern and creative HTML pages that can be used for business, corporate, agency websites, personal, portfolio, and other types of websites. It has five main one-page layouts to choose from, with eight color variants to help you create just the right online portal that suits your need and matches your image. Qube also comes packed with awesome features which include cool animations, smooth scrolling effect, a text rotator, Google Fonts, Font Awesome icons, and W3C validated code among others. Its fully responsive design allows your website to adjust to any screen size or resolution and look equally great no matter which device it is viewed on. Then, we have Nyx. 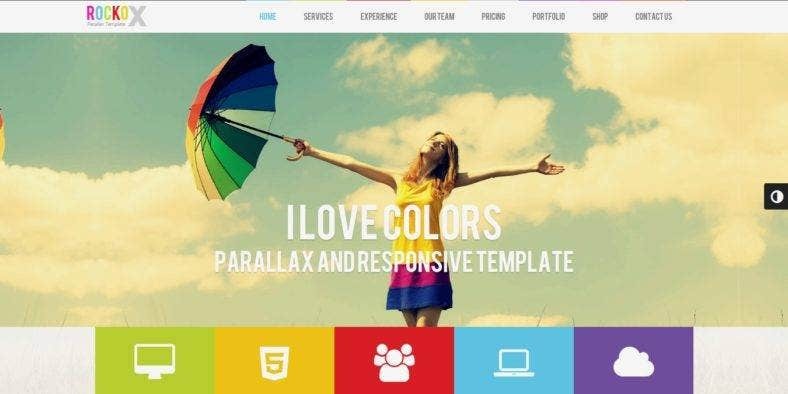 This one-page creative Bootstrap theme is a bright and colorful website template with a unique and stunning design aesthetic that you and your audience will surely love. Built on Twitter Bootstrap 3.2 and developed with SASS, it includes a bunch of powerful and cool features which makes this theme highly functional and extremely customizable. Nyx comes with a great combination of colors over a classic design and simple layout, integrated with some cool animations and effects for added visual value. Aside from the ones mentioned, the theme also features a super stylish and animated introduction page, with animated About, Services, and portfolio sections. It also has animations on every scroll. Quick is a multipurpose website template that boasts of a clean and creative design which is as flexible as it is responsive. A one-page parallax HTML5 theme, it is made for businesses, companies or individuals who wish to present their products, services, or works with a modern and elegant web portal with all the latest and trendiest web design technologies. The theme comes with four demo options which have both light and dark versions, a video background, and other cool features. It also includes a minimal landing page and coming soon page, separate blog pages, and single page portfolio. Among Nyx’s features are a responsive layout, gorgeous typography, parallax sections, working contact form, and others. 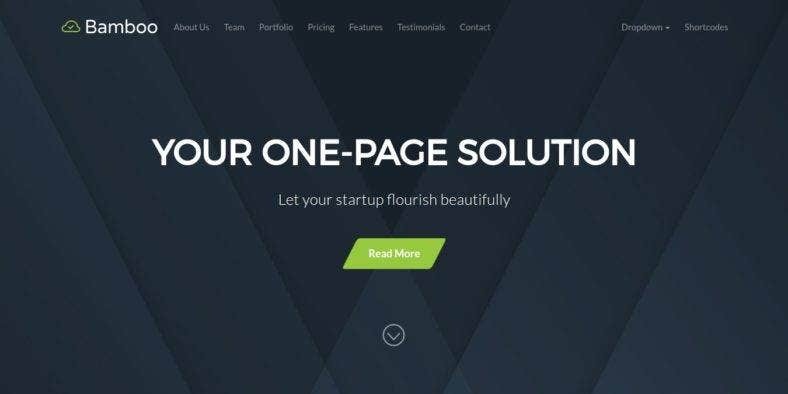 The smooth and minimal website theme you see above is Bamboo, a one page solution for many business, corporate, and startup websites. It is a clean and modern website built for multiple purposes as it is characterized by an uncluttered layout and a fresh color scheme that will surely catch your audience’s attention and keep your potential clients’ interest. Among its many features are the fully responsive design which converts quickly according to the device in which your website is opened, a smooth and easy scrolling effect for better navigation and impressive user experience, a stunning portfolio to present and highlight your best works, and a fully functional Contact Form to keep in touch with your visitors. Next is Agen, a one-page creative portfolio template with a beautiful design that is clean and modern, as well with powerful functionality thanks to all the Bootstrap features included in the template. With such great features, the theme will help you showcase your works with Ajax loading projects and build your mailing list with Mailchimp integrated forms. Other features include eight awesome headers and eight pre-defined color schemes to choose from, parallax and video backgrounds, Font Awesome icons, Google Maps, and so much more. It also integrates working AJAX Mailchimp forms with validation as well as a working AJAX PHP Contact Form with validation. Agen is also fully responsive and retina-ready. 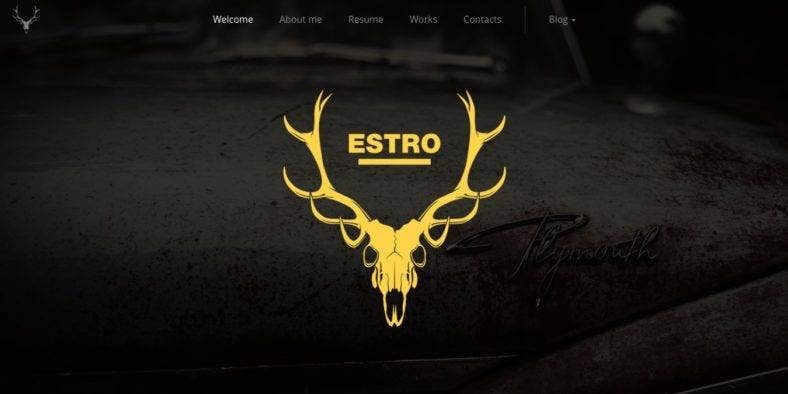 This next dark-themed web design template is Estro, a responsive one-page website theme made especially for virtual cards, online resumes, or personal portfolios. Built with Bootstrap, this template is developed using the latest HTML, CSS, and JS standards, along with a feature-rich JQuery library, which make your web projects fully responsive and mobile-ready. Its features include Fancybox, a tool that offers a nice and elegant way to add zooming functionality for images, HTML content and multimedia on your web pages, Isotope filters to filter and sort magical layouts, a dirt-simple parallax scrolling effect, a Vegas plugin to add beautiful backgrounds and slideshows, an OWL Carousel for a beautiful responsive slider, etc. Then, we have this cool HTML business website template with a bold and colorful design but with a clean and modern one-page layout. 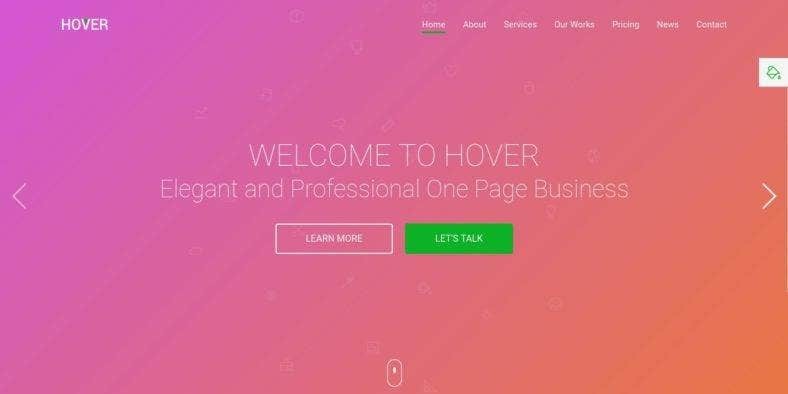 Hover is just the right web design tool to help you build a perfect free business website of a creative online portfolio. With its elegant aesthetics integrated with fancy CSS3 animations, you will be able to create an impressive website. Aside from its great looks, Hover does not fall short on its functionality. 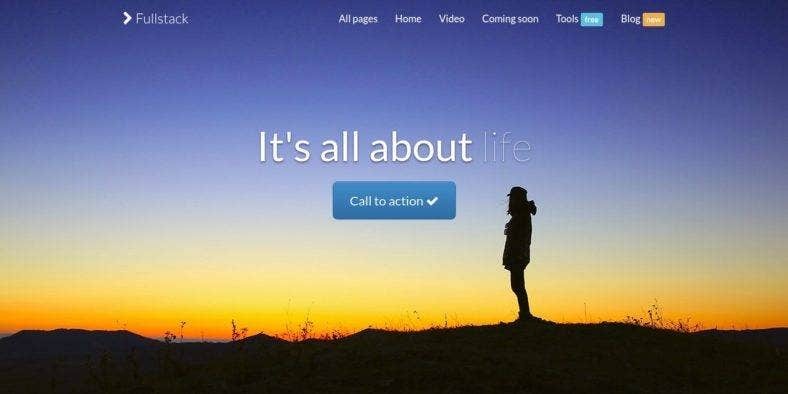 Featuring some cool and awesome attributes which include four homepage options, portfolio detail types, pre-defined color skins, working Ajax Contact Form, fully responsive design, and many others, your website will be able to provide your visitors with an amazing user experience they will never forget. To end this list, here is Red. 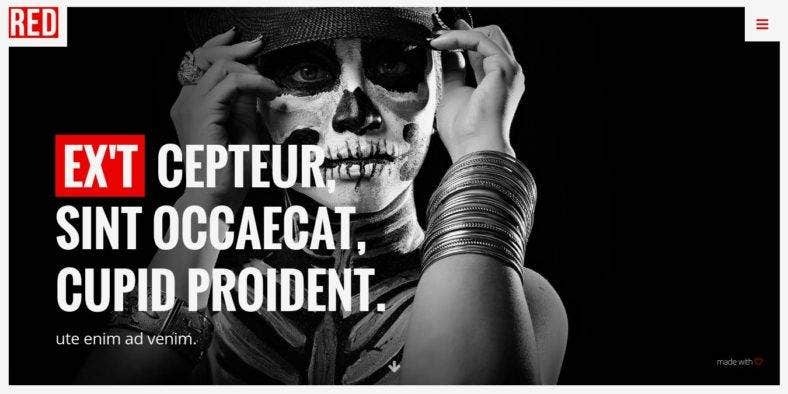 As you can see, it is characterized by a dark color scheme, bold typography, and some creative imagery. 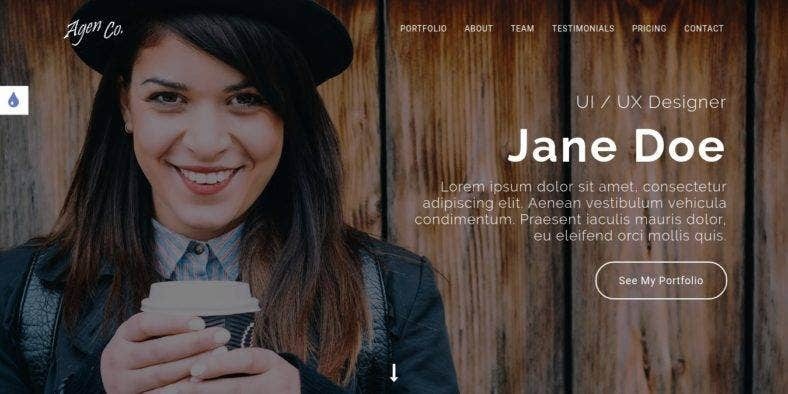 It is because this responsive one-page HTML template based on the popular Bootstrap framework was built particularly for design agencies and creative studios, which usually require a unique web design with lots of functionalities. 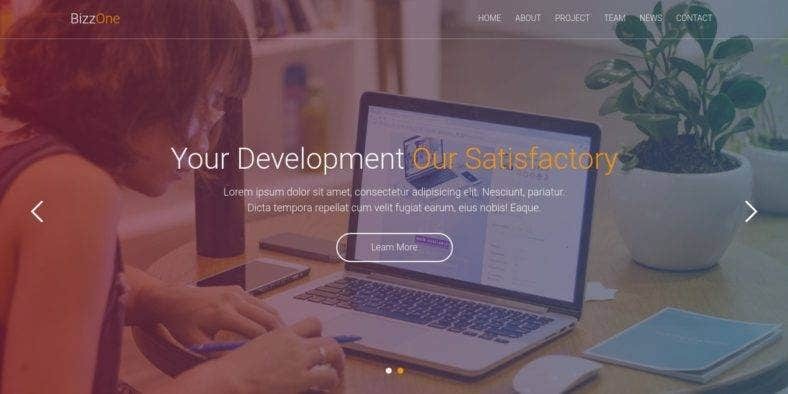 With that in mind, the theme’s developers include some awesome features such as a fully responsive layout with parallax and video background support, Google Web Fonts and Font Awesome icons, a full-screen intro, a carousel slider, Magnific popup, additional 404 error page, and more. Also, Red is compatible with all major browsers and many mobile devices. There you have it. Keep in mind that this comprehensive list is brought to you by the brilliant minds of Template.net to help you build highly professional and extremely creative websites for your businesses, organizations, and personal use. As you may have already known, one-page websites have been gaining lots of popularity nowadays. Unlike traditional web designs and layouts, they remove the clutter and establish a practical flow of information which usually leads to a compelling call-to-action that your visitor can hardly refuse. It also guarantees an engaging user experience as browsing through the site becomes an exciting journey. So, make sure to grab one of these modern and creative one-page themes and templates to kick-start your new web project or upgrade your existing but outdated one. Packed with lots of powerful features and tons of customization options, one-page websites do not only optimize your content, but also help you save a huge fraction of time and energy as it is easy to set up, modify, and maintain. With the many advantages and benefits of using a one-page website, you are guaranteed to make a banging online presence that will help your endeavors reach new heights and gain more successes.